As part of his research into the Slade history, Stephen Chaplin had the foresight to undertake a series of audio interviews with former Slade staff and students in the early 1990s. Over the past few months we’ve been selecting highlights from those interviews and publishing them online through SoundCloud. But now the tables have turned and the interviewer has become the subject of the interview. Excerpts from an oral history recording undertaking with Chaplin in 2013 have just been added to the growing collection on SoundCloud, and provide rich evidence of his contribution to the ‘biography’ of the school’s archive. He reminisces about his entrance interview in 1952; the teaching staff’s interpretation of the so-called ‘Euston Road School’ orthodoxy; encountering Bernard Cohen painting as a young student; art history teaching at the Slade in the 1950s; working with Lawrence Gowing; and tells the story of how he came to be charged with the task of ‘sorting out’ the Slade archive. Listen to the clips here. 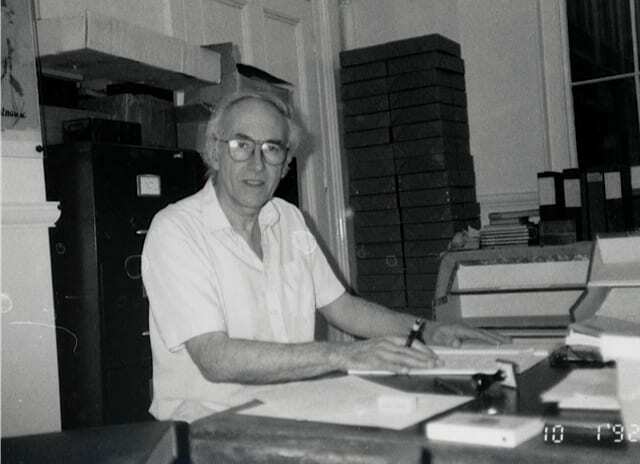 Stephen Chaplin working on the Slade archive, 1992. We’re delighted to announce that the Slade has recently received a grant from the Andor Charitable Trust to develop a Slade Oral History programme. During our archive explorations, we (re)discovered an invaluable collection of oral history recordings undertaken with former students and staff. The interviews were conducted in the 1990s by the Slade’s former archivist Stephen Chaplin. These audio recordings provide fascinating insight into the impressions and experiences of former students and staff, many of who are no longer alive. However, they are now in danger of eroding and urgently require digitisation. So we appealed to the Andor Charitable Trust who has agreed that these treasures are worth saving. Alongside our efforts to preserve the existing recordings, we hope to undertake a series of new oral history interviews. Much of what takes place in the life of an art school is conversational and informal and as a result, rarely formally documented. The use of oral history recordings will enrich our existing archive records, allowing us to capture some of these anecdotes and conversations – and help us map the networks of connections between individuals, their art practices and the wider influences that draw them together.